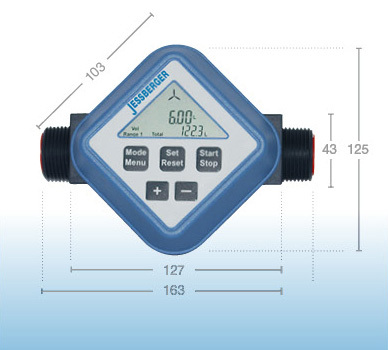 JESSBERGER offers with the series of these turbine meters made of PP and PVDF, handy, easy to use and inexpensive devices to measure reliably and accurately watery, media similar to water and in this case particularly aggressive media such as acids and alkalis. The meters are suitable for installation as a stationary counter as well as a manual flowmeter at the drum pumps. The viscosity of the medium to be measured must not exceed 20 mPas. In addition, it must be ensured that a constant, non-pulsating flow of 20 -120 l / min. is given and the operating pressure does not exceed 6 bar. 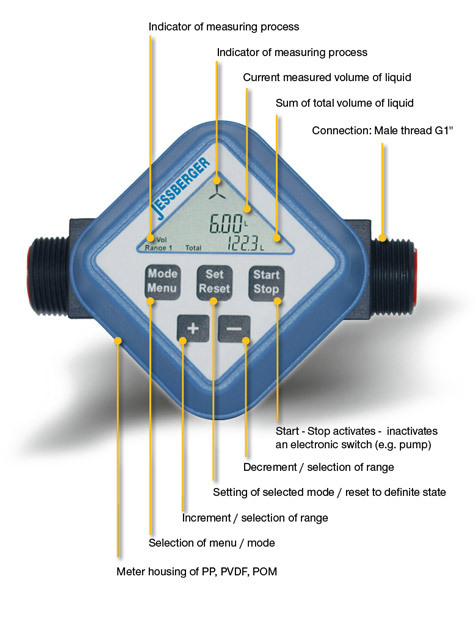 The measurement accuracy in a calibrated state is in compliance with these parameters and in consideration of the required inlet and outlet distances ± 1.0%. Also any medium reflows are subtracted immediately. The counters are factory pre-calibrated in the range 1 for water-like media. For the user there is the option to calibrate the turbine wheel meter according for more low-viscosity fluids. For this, three additional calibration ranges are available. The counter is set by default to liters and can be changed by a few keystrokes on gallons. The turbine wheel meter is a volume meter. It consists of a measurement chamber with an axial turbine wheel that moves freely due to the incoming liquid, as well as a lid which contains the electronic evaluation unit, the display and the keyboard. The turbine wheel assumes a speed corresponding to the mean flow velocity in the free cross section of the turbine. This speed is proportional to the volume flow rate and the number of revolutions to the volume that has passed. From the turbine wheel detected measured values are transferred and processed sealless and contactless. In series FM 120 a turbine wheel made of PVDF is also brought due of the liquid flow in rotation, and then actuates a sensor contact. The sensor signals are processed by a microcontroller, analyzed and displayed on the shapely, clear display in digital form. Measured flow rate in liter (non resettable total, resettable subsets). Flow rate in liters per minute. Presence of a flow (clockwise rotating turbine with proper flow direction). Factory calibration three additional calibration ranges. Pulse output (FM 120 I). 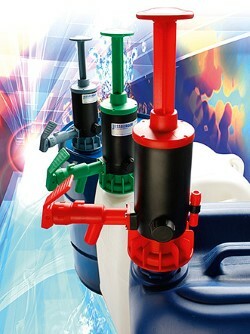 Quantity preset to control a pump, a magnetic valve or a ball valve (FM 120 M01). DC version (Power supply of 24 volts). Specifying the desired flow volume as part of a quantity preset (available as an option). Change the measuring unit from liters to gallons. Power supply by a lithium battery whose capacity has an operating time of up to 3 years. If within a period of 120 seconds no button on the display is pressed nor a minimum flow is detected, the device automatically switches to power-saving mode. The currently displayed values are stored hereby. Due to the high accuracy and reliability the two turbine wheel meters are used especially in process control and in many cases in almost all branches of industry. 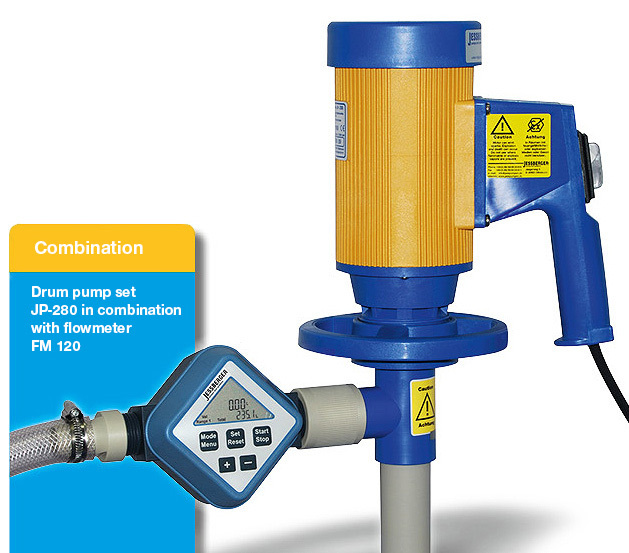 The two flowmeter from PP and PVDF have proven especially in relation to the drum pumps of JESSBERGER and applications in the chemical and electroplating industry for more than ten years. Medium Water, ambient and water temperature: 20°C. 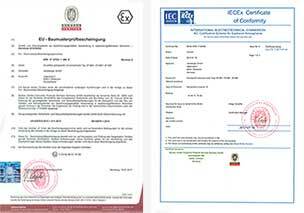 Compliance with the requirements for the minimum inlet and outlet sections and the appropriate internal diameter of the piping. In an optimal installation, both inlet and outlet sections are at least 75 cm with a tube diameter of 1″. Recommended installation: Upright (display above keys down), position of the measuring system up, the flow should be in the direction of arrow.